Silver Mexican Libertad coins produced between 1982 and 1999 feature the Mexican National Coat of Arms: a Mexican Golden Eagle perched on a prickly pear cactus, battling a snake, and surrounded by a wreath on the obverse side. From 2000 to date, the obverse shows the current Mexican Coat of Arms where the National Shield is surrounded by ten historic heraldic eagle designs used as national emblems over the years, including the eagle in the Codex Mendocino. Mexican silver Libertad coins are available for purchase from the CoinInvest online store. Simply select the coin of your choice to take you through to the product description page and add the coin to your shopping cart by clicking on the highlighted orange band. A premium choice for investors around the world, the Mexican silver bullion coins have become most popular thanks to their high purity, outstanding quality and appealing design. Given they are minted in relatively low numbers, the coins offer excellent collectible value. The National Mint of Mexico produces both gold and silver bullion Libertad coins. They are struck in .999 pure gold or silver and are available in a wide array of weights: 1/20, 1/10, 1/4, 1/2, and one troy ounce for both gold and silver coins, while 2 oz., 5 oz. and 1 kilogram proof-quality silver coins are issued for marketing purposes. However, the one ounce coin is by far the most available and popular bullion of the Libertad Series. In 1981,596,000 1 oz Gold Mexican Libertad brilliant uncirculated coins were issued, but then production seized for 10 years. From 1991, gold Mexican Libertad was issued in smaller quantities and not every year. 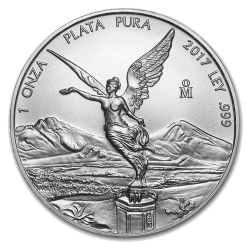 It is reasonable that silver Libertad is the National Mint of Mexico's strong point as the country is the single most important producer of silver in the world, and currently accounts for about 20% of the world's total silver mine production. The region has historically yielded over 310,000 tonnes of silver. Silver Mexican Libertad have been issued every year since 1982; for the brilliant uncirculated version, 1986 for the proof version, 1995 for the 2 and 5 ounce versions, and 2002 for the one kilogram version. Interestingly however, there were years when mintages were very low: in 1998 only 67,000 1 oz coins were struck, compared to an average ¾ of a million that is usual in latest years. With the arrival of the Spanish in 1519, Mexico's long-established Mesoamerican civilizations was fused with European culture. For over three centuries, abundant silver deposits in the newly acquired colonies allowed the Spanish Empire (whose legacy is a country with a Spanish-speaking, Catholic and largely Western culture) to mint massive quantities of silver coins. After a protracted struggle (1810-1821) Mexico declared its independence from Spain in 1821 via the Treaty of Córdoba. The Mexican Libertad coins celebrate this victory and are a brilliant investment both as a store of value, and as a moderate collectible, especially in the case of low mintage issues. On the reverse side, coins minted between 1982 and 1995, depict the Angel of Independence, a front-facing winged Goddess Victoria (the archetypical personification of good over evil) standing on her right foot upon a pillar. From 1996, the Libertad has featured Goddess Victoria, but from a different angle to give more overall depth. The monument was built in 1910 in Mexico City to celebrate the centennial of Mexican Independence from Spain. In the background are the twin volcanoes of Popocatιpetl and Iztaccihuatl. Over the mountains are inscriptions stating the content, the date of issue, and the purity of the coin. The edges of the coins are reeded. The National Mint of Mexico, one of the world's oldest silver mints, continues its long tradition of manufacturing some of the world's finest silver bullion. Originally established by the Spanish in 1535,following their conquest of the Aztec Empire "La Casa de Moneda de México" was the first mint in the Western Hemisphere. After the impressively automated procedure of minting is concluded, the coins undergo a most meticulous inspection and leave the factory flawless. Having claimed numerous prizes and awards, the National Mint of Mexico's vision is to "be the Mint World number one in terms of the quality and innovation of all bullion products." Based on a continuous improvement process, the production, inspection and security systems are permanently tested and developed. Objectively speaking, such quality of craftsmanship is impossible to duplicate. Struck in pure .999 fine silver, the Mexican Libertad coins are highly recognizable among all bullion dealers, and a brilliant, affordable way to diversify any bullion coin investment. CoinInvest welcomes anybody selling Mexican Libertad silver coins and promise to make a competitive offer based in current market spot prices. If you have any Mexican Libertad silver coins for sale, contact a member of our friendly team who will be happy to prepare an offer for you and confirm the same by email.